The two-buffer/loop mechanism described above works great in software but only for coarse-grain objects such as neurons in a network or cells in a cellular automaton. For fine-grain parallelism, it must be applied at the instruction level. That is to say, the processor instructions themselves become the parallel objects. However, doing so in software would be much too slow. What is needed is to make the mechanism an inherent part of the processor itself by incorporating the two buffers on the chip and use internal circuitry for buffer swapping. Of course, this simple two-buffer system can be optimized for performance by adding one or more buffers for use with an instruction prefetch mechanism if so desired. Additionally, since the instructions in the buffer are independent, there is no need to process them sequentially with a traditional CPU. 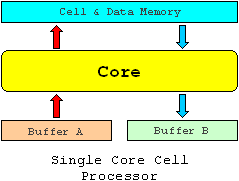 Ideally, the processor core should be a pure MIMD (multiple instructions, multiple data) vector core, which is not to be confused with a GPU core, which uses an SIMD (single instruction, multiple data) configuration.